So we start 15 with a bang. Dollar, bonds and GC all up. Been sitting in the weeds for a long while now SA miners looking good here. I've been on ice but it melted. It's been a long wait, and beyond expectations. I'm not really sure why I should be encouraged, but then I'd like to think I still have a long life ahead of me - patiently waiting. Buys on both my systems so I took a small long trade in GLD a few weeks ago based on this and a trendline break but laying low until we get above the 200DMA's. Two subscription gold timers have called a LT bottom and recommended starting to buy past few weeks. Looks like Doc is turning bullish! 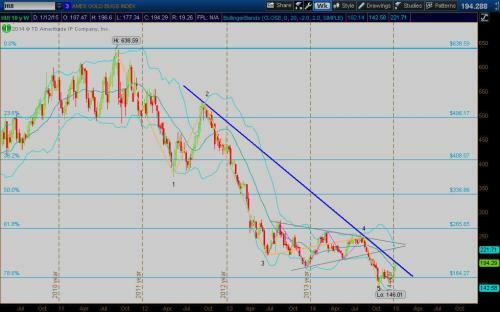 I'd like to see gold make a 3 month march upwards like last year when it rose from mid December to mid march. We might be able to see it back to those highs. HUI very clean EW 5 wave structure complete with a common wave 4 triangle, Wave 5 thrust out of triangle completed (equal to base.) Minimal retracement back into Wave 4 triangle apex area is what EW says should happen. Real test will be if it breaks upwards from there for a larger retracement of the whole impulse down. Currently up against 2-4 trendline. Looking to add miners with GDX upon breaking it. Then see how it does back at the triangle. Just took out the weekly Bolli band center MA so that's good! we are 7 quarters along in this sideways move in Gold. There is money flowing into the USA right now and its concentrating itself inside the bond market. Gold will have its day in the sun and we are getting closer to that pint in time. Risk/reward wise its an excellent time to take some long positions in the space. I would favour the boys with clean balance sheets, increasing production profiles and without major country risk. using the GLD as a proxy the weekly volume is expanding. The Oct/14 high of 120.50 has been cleared. Down sloping trend lines- one drawn from the March/2014 high the other longer term one drawn from the Oct /2012 high- are both broken. there is major resistance overhead at the 130.50 level see the low of the monthly candle from April/2013. Reply to hanky's HUI chart...............she is a long way back to the 640 level so if this is only a bounce in the bigger picture then holding off buys until the 260 level is taken out with conviction might be the more conservative approach. Charmin that move you mentioned didn't have any volume behind it. looking at the current month ( using GLD as a proxy) we should be able to do more than 200M which is 50M more than December of 2014... on the quarterly chart we are going to need 1 Billion shares to work off the downdraft from Q2 2013...right now it looks like we are only on pace for ~ 700M shares... I don't expect the GLD to makes its move until after Q3 2015......my guess is we are going to chop along until that time. 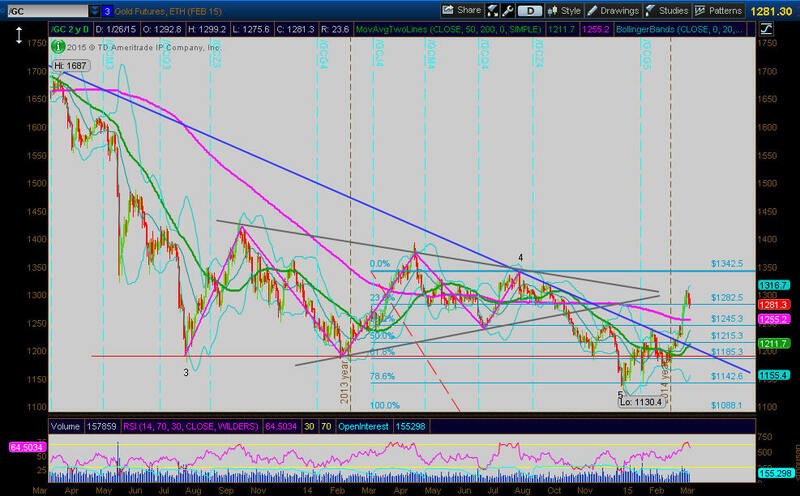 GLD looking for one more thrust up into the 129 level or on the continuous gold contract maybe the 1325+/- level. Then its a retrace back into the base...................... 117 level on the GLD or 1220 ish on the GC. hello Tokyo...is there anyone home? GOLD back to wave 4 triangle apex. HUI is still below its apex so it makes me suspect it will make another thrust up, see if GOLD goes along and pushes towards top of its triangle before stalling out longer term. Holding GLD and GDX trades nicely in black thus far. Ageka, I hope you are right. I may be in outer space on this one but I am looking for a .786 fib retracement from the low of $1130.40 to the high of $1307.80 that would bring gold down to my target price of $1168.36.